The King of the Standing Ovation! An idle boast? Not if the response of his audiences are anything to go by. There are many singers. There are many entertainers. There are fewer singer/entertainers. Stephen Bayliss effortlessly and seamlessly combines both these roles to provide clients with a night that they will remember for a long time to come – with of course a standing ovation! Vastly experienced, having toured with Cliff Richard, led his own band, taken the lead in The Nat King Cole Story and with countless performances under his belt, Stephen is the master when it comes to engaging with an audience. His talent, polished performance skills and pure sense of enjoying what he does comes over to all that are privileged to see and hear him perform. 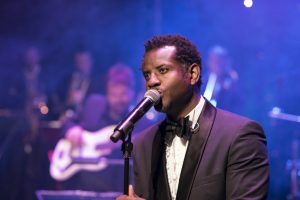 His fabulous vocal talent takes his audience on a journey of classic songs from any era by major recording artistes ranging from Johnny Mathis and Matt Monroe to Lionel Richie and Michael Bublé. You want Motown, Pop, Soul or Rock? Then he’s got it. His warmth and versatile style of entertaining has his audiences spellbound as he weaves his mercurial way through some of the best songs ever written. With such a large range of styles and music, Stephen is used to tailor-making his set list to suit the client and the event. Stephen uses his own professional sound and light company to maximise the impact of his performance or can adapt to the clients own facilities. Having recorded own solo material with a 42 piece orchestra and performed in front of a huge numbers of bands, he is well versed in delivering the perfect performance for your client. At the recent RSVP North event in Manchester, Stephen was asked by the organisers to perform a few sets for the trade exhibitors and visitors, which he did to universal acclaim. Previous corporate clients include Halliwell Jones BMW, Bowker BMW, Specsavers Opticians, JJB Sports, Bentley, Key Retirement Solutions, to name a few. I was so flattered to be featured in Lancashire Life. I wanted to share the article with you all here.